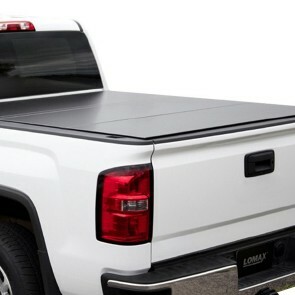 Hard Tri-Fold Cover maximizes your truck with a low profile design and maximum protection. 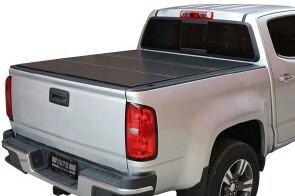 This lightweight hard tonneau cover is designed for strength, security and style, while being easy to use and offering a simple one person removal. This hard folding cover uses strong aluminum panels with durable, reinforced vinyl coated hinges. The panels are made from aluminum alloy and are coated with a textured matte black finish to perfectly complement your truck. 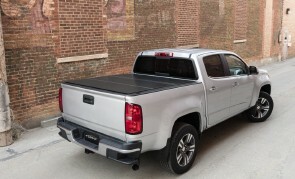 Extruded aluminum channels under the panels keep the hard truck bed cover rigid while reducing weight. Flexible rubber seals, vinyl coated hinges and limited metal-on-metal contact all work together to reduce noise and vibration for a quiet ride.